Milk chocolate with soft caramel (30%) and crispy biscuit centre (5%). 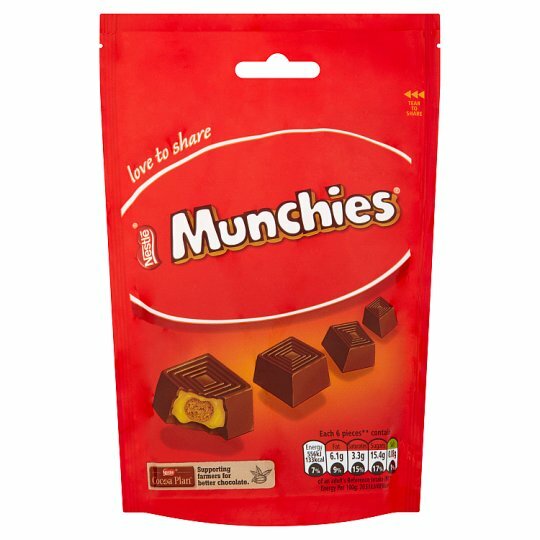 MUNCHIES® sharing bag, 126 grammes of delicious milk chocolate cubes encasing a soft caramel & crunchy biscuit centre, making them the ideal treat to share with family and friends. 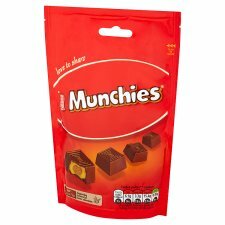 MUNCHIES® were originally created by Mackintosh's and were launched into the UK market in 1957. The product has since launch been an individual milk chocolate cuboid shell filled with a sweet, buttery, soft caramel and a crisp biscuit piece. Since the 1960's the MUNCHIES® branding has been white text with a red background. Initially MUNCHIES® were produced at Mackintosh's factory in Norwich, however in 1994 production was moved to Newcastle where they still continue to be manufactured to this day. 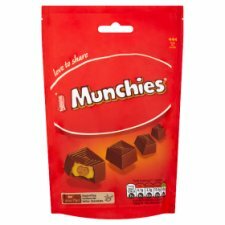 Over the years there have been a number of different flavour variants launched under the MUNCHIES® brand including Chocolate Orange in 1977 and Banoffee in 1996, however the original has remain consistantly the favourite flavour within the range. In addition to the 52g tube and 126g sharing bag which can be found in retailers all year around, the MUNCHIES® range also includes Easter Eggs and Christmas giant tubes. For more to share, why not try the MUNCHIES® 100g Giant Tube - only available at Christmas! 4 Know your servings, 6 pieces = 1 serving. Pack contains approximately 4 servings.